Brochures and Campaigns - Impact Communications, Inc.
John Barton had been successful for over twenty years but knew his new Wealth Management focus required a unique and elegant brand. After in-depth branding conversations with Impact Communications, John established CenterPointe Wealth Management. Everything from the company name to the tagline, the logo, stationery and brochure reinforces John’s client-centered philosophies. The print pieces were designed to reinforce the concepts through the placement of the brandmark on a split field of solid and negative space. This stunning suite of materials, the recipient of a Print Media Award of Excellence (the highest award possible) in The Communicator Awards 2008, this identity package is quality design and aptly represents the professional talent available to you through Impact Communications. See brochure. This elegant brochure incorporates the use of three distinct papers, custom die cutting, metallic ink, and carefully chosen photographs. The strategic use of white space connects not only with the intellect of the reader but also with the senses and sensibilities. The skilled design transforms the ordinary act of reading into an exquisite experience and reinforces the client-centered message expressed in the copy. 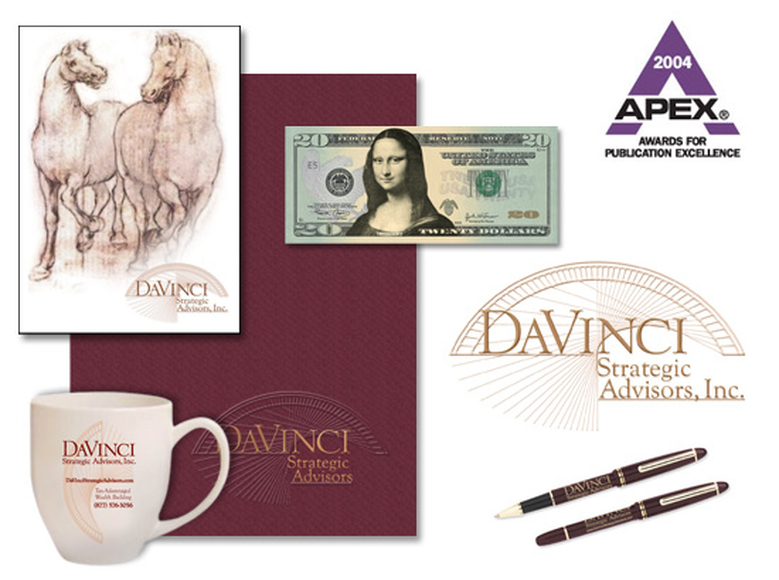 In addition to this brochure Impact Communications also designed Asset Preservation Strategies’ logo and tagline, along with a full suite of matching stationery items. When Brian Puckett decided to improve his firm’s visual brand, the Impact team was happy to partner with this long-time client. After a lengthy “brand identity” conversation, we determined a new tagline and visual direction. We then designed the new logo and applied the branding elements throughout all his print and online materials including: business cards and matching stationery items, newsletters, magazine ads, a PowerPoint template and Web site. 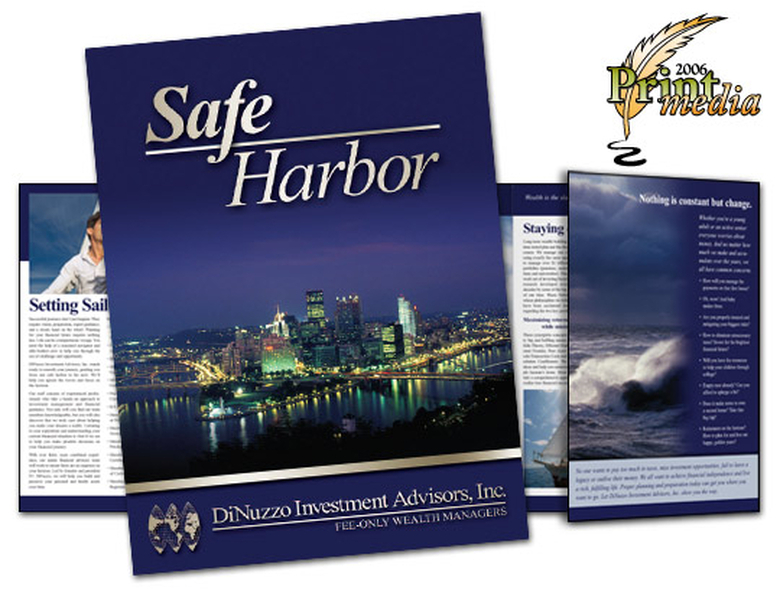 This oversized brochure uses a sailing theme to drive the message. It also ties the imagery to a local landmark – the harbor. This boutique wealth management firm competes with big institutional players and, until the creation of this piece, lacked the proper positioning. Now they can go toe-to-toe with their deep pocket competitors – and win. We also developed a full suite of updated stationery materials, fancy email signatures, branded Powerpoint template, and more. See the brochure. Impact Communications enjoyed the challenge of revamping two identities – Retirement Plus, Inc. and Financial Workshops LLC – in a way that best presented the sister organizations to their target clients. The look is still coordinated and put together. After 15 years in the business, the logos and collateral materials they had were old and tired – now they are vibrant and alive. 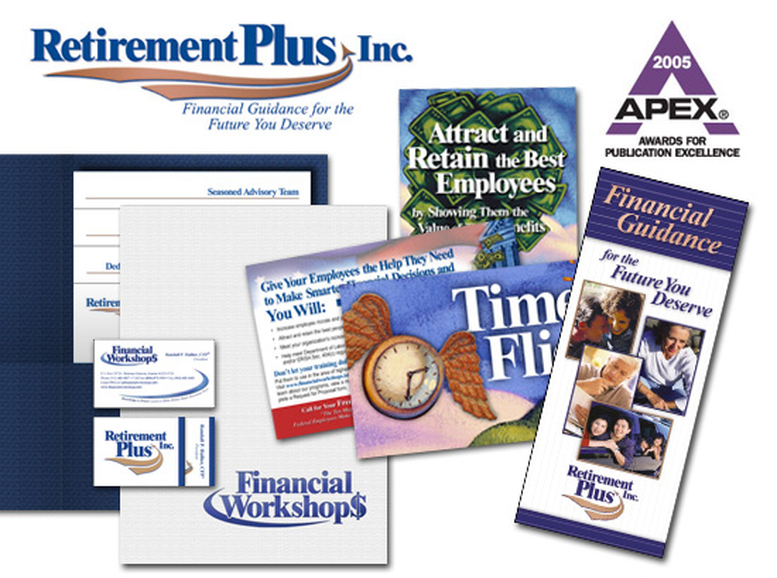 Read the Retirement Plus brochure. This APEX award-winning campaign included creating the firm’s brand from the ground up. Our team prepared invitations, activities, and gifts for the firm’s introductory event. Read more about the Creation of the DaVinci brand. 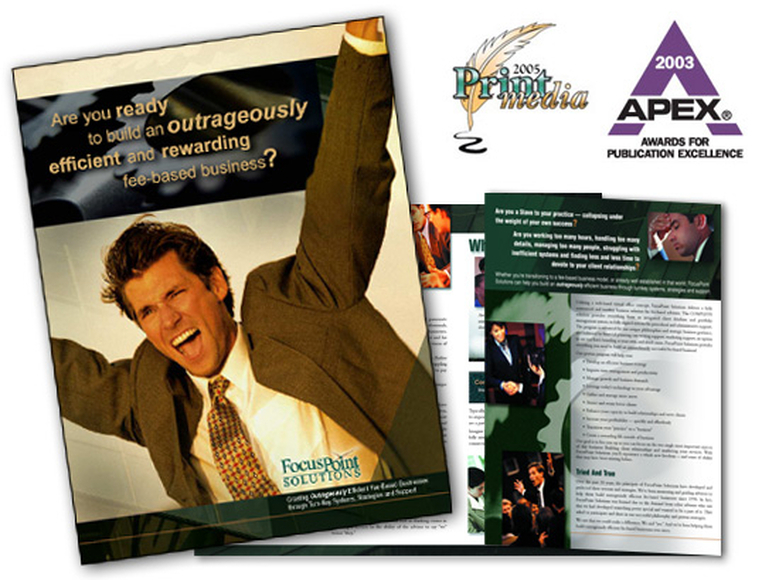 This business-to-business brochure is 9” x 12” with 6 1/2 panels. It is professionally printed, in full-color, with a heavy coating. The brand was extended through a full set of stationery, e-newsletters, postcards, advertisements and a custom Web site. An Impact-led national publicity campaign enhanced the firm’s reputation and visibility. ﻿See the brochure﻿. 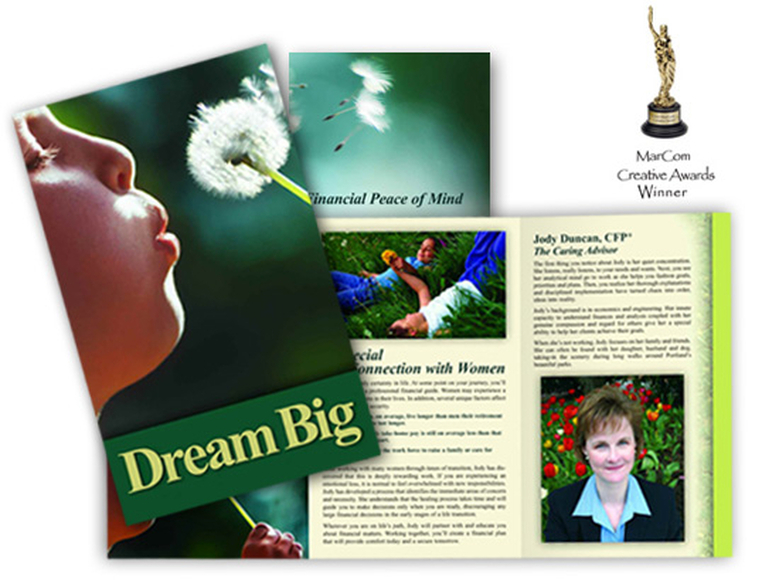 This client-centered brochure was developed to highlight the unique personality, qualities and skills of Certified Financial Planner™ professional, Jody Duncan. It has strong appeal to her ideal clients: women in transition. This personal brochure fits into the back of her parent company’s larger and more institutional brochure. See the Dream Big brochure. 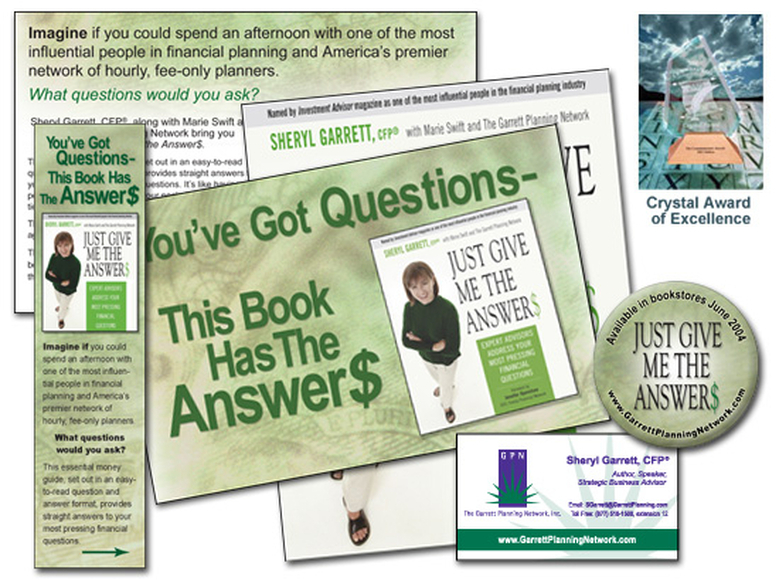 Marie Swift helped write, edit and bring this 337-page book to market. Coordinating and polishing 134 contributions from over 75 financial planners was no small feat. She and her team then developed and spearheaded a grassroots, national publicity campaign that utilized the enthusiasm of the 200+ planners in the Garrett Planning Network. Our efforts on this project earned a 2005 Communicator Awards top-tier Crystal Award of Excellence. Read the news release now. See some of the Web sites we’ve developed.